Disney Fantasia: Music Evolved is a breakthrough musical motion video game inspired by Disney's classic animated film "Fantasia." In the game, players enter the magical realms of Fantasia, selected by the legendary sorcerer Yen Sid, to hone their musical and magical prowess as his new apprentice. 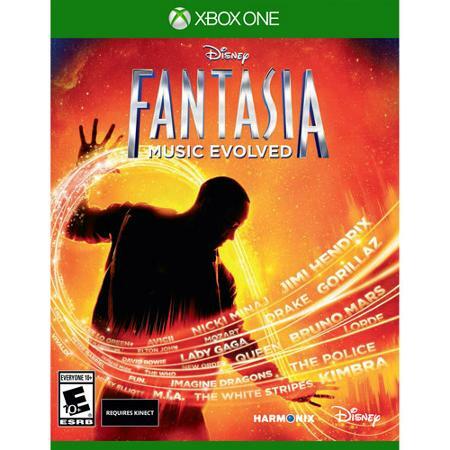 Disney Fantasia: Music Evolved takes players on an interactive and immersive motion-controlled journey through worlds of music and magic. Players will control music spanning all genres and eras, including classics from the original film such as "Night on Bald Mountain" to over 30 hit artist selections ranging from chart-topper Bruno Mars to rock royalty Queen and electronic DJ and producer AVICII. Using Kinect motion control technology and natural, controller-free gameplay, players will control the musical flow of these hits, unlocking the power to transform the music and living world.